by Lucia Votano, internationally reputable physicist, expert in astroparticle physics. Earlier researcher at INFN Frascati National Laboratories, later she became Director of INFN Gran Sasso National Laboratories. Currently member of the JUNO experiment that will carry on fundamental studies on neutrinos. 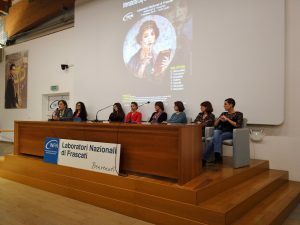 There were many – and all of them brilliant and passionate – women researchers at Frascati Laboratories, participating in the day of reflection on the role of women in Science. By illustrating the subjects of their research activity as well as the personal journey which determined their career choice, they showed the unfoundedness of stereotypes and prejudices that even today discourage many young female graduates from choosing a STEM course and pursuing research. The figure we should reflect upon is that female researchers worldwide represent less than 30% of total. At the end of the round-table, there was no lack of discussion about the causes of this phenomenon and the possible solutions to bridge the gap. I was asked to speak and I preferred to put the debate on a broader basis, pointing out that Italy is one of the developed countries with the lowest number of researchers all over the world. Only Chile, Turkey and Poland register a percentage lower than ours. Italian researchers are a few more than the four parts per thousand of the labor-force, while the European average is 1% and, for example, in Korea they take up the 1,2%. The presence of researchers in Italian companies is particularly underdeveloped in respect to other countries. Furthermore, we invest in research and development (R&D) about 1% of the PIL, compared with 2,90% of Germany, 3,4% of Sweden or 4% of Korea, one of the lowest values in Europe as well as in the OECD. Therefore, the problem of women in science is just one problem within the broader issue of low level of scientific research. Women, still having to fight against bias and discrimination – often performed in deceitful ways – are the weak link in the chain and are those who suffer most from the general issue. Even if 50% equality were achieved, women (and men as well) would still find it very difficult to carry on scientific research. The migration of our graduates to Europe, United States and even to Australia is a terrible reminder. Anyway, it is legitimate to ask if R&D underinvestment is only one of many Italian problems or one of the main causes of our economic and social decline, the reason for not having overcome the economic crisis begun ten years ago, while at the same time social inequalities increase. Generally, those working in the research field at international level are very aware of the truthfulness of the second hypothesis. It is useful to report some data and examples in support of this claim. In 1980 South Korea average per capita income was a quarter the Italian one, the graduation-rate was lower, and the Gini index (which is used to measure social inequality) was higher, one of the highest in the world. Also with the support of the International Monetary Fund, they decided to invest in research and training activities and today 70% of young Koreans is graduate, per capita income is about 20% higher than the Italian one, and the Gini index is definitely decreased, in other words their society became more cohesive. Sadly, we must record that, in the same years, Italy conducted a completely opposite policy and now we are Europe’s tail-end. On the other hand, nowadays, at global level, we are definitely part of the Society of Knowledge. Science and scientific research form an integral – actually the dominant – part of the wider concept of Knowledge which has become the main driving force behind cultural, social and economic development of every nation. Mankind is realizing one more revolution: an economy based on intellectual work and knowledge which replaced industrial society based on machines and factory work. The production of goods and services through scientific research and all forms of creativity is now the majority at global level. If Italy goes wrong, also Europe is falling behind. On the global stage of Knowledge economy the new players are the Asian Countries, first of all Japan, and now also China, South Korea, India and others. The production of new knowledge is increasingly moving to Asia, while Europe retrogresses and plods along compared with the two giants, USA and China, that are also – no coincidence – the major political and economic powers. Just 100 years ago, Europe was almost the only depository of Science; around the 1920s and ‘30s the axis moved to North America; these days to the Far East. Considering R&D global investments, Asia holds 40%, North America 29% and Europe just 21%. Today Europe invests in R&D a little less than the global average. China has overtaken Europe in absolute and relative investments, as well as in number of scientists. If Europe wants to try to arrest its political and economic decline, it must recover in terms of Knowledge and that can be achieved only by remaining united and solidary, because no one country individually, not even Germany or the Scandinavian Countries that invest the most in R&D, can compete on an equal footing with others. We particle physicists are very familiar with CERN and we know that this is true, but Science and technological innovation go further than our field. There is also a need for a fair development of Knowledge, since diversity in accessing it results in an increase of inequalities between different Countries, as well as between different citizens of the same nation. Therefore, Italy and Europe must not only try to keep up at global level, with adequate investments in cultural and research, but also to guarantee a more substantive democracy in allocating and managing knowledge, whose economic and social benefits must be distributed more fairly. So, in such a scenario in which Europe – particularly Italy that is at the very bottom – is losing ground in terms of Knowledge economy, it would be desirable that women, especially researchers, actively prove they figured out the root causes of the problems and become the protagonists in the fight for the relaunch of a knowledge-based European Union, beyond the defense of their own particular concerns, even if these are of great general interest. This is about the future generations to come. In addition to rightfully fighting for gender equality in government, it would be useful if women endorse the Europe of Knowledge issue, acquiring a high profile in every way their imagination can suggest. Bearing in mind some recent examples of events that took place in squares in Turin and Rome, I believe we must create networks, reach a consensus to chant a slogan in favour of a united, democratic, solidary Europe, protagonist of the Knowledge Society. Maybe it’s time for women and men in science to set aside their study for a day and promote demonstrations or flash mobs simultaneously in different European cities in order to revive the ideal of European Union, a European Union based on development and fair distribution of knowledge and culture and able to ensure many more years of peace and prosperity for the new generations.